Whether it’s preserving cultural landscapes, regenerating informal settlements, retrofitting sprawl, designing waterfronts or transforming highways into civic axes, our program addresses these challenges with a unique methodology that encompasses practices from urban design to landscape architecture and works at a scale between neighborhood and region. 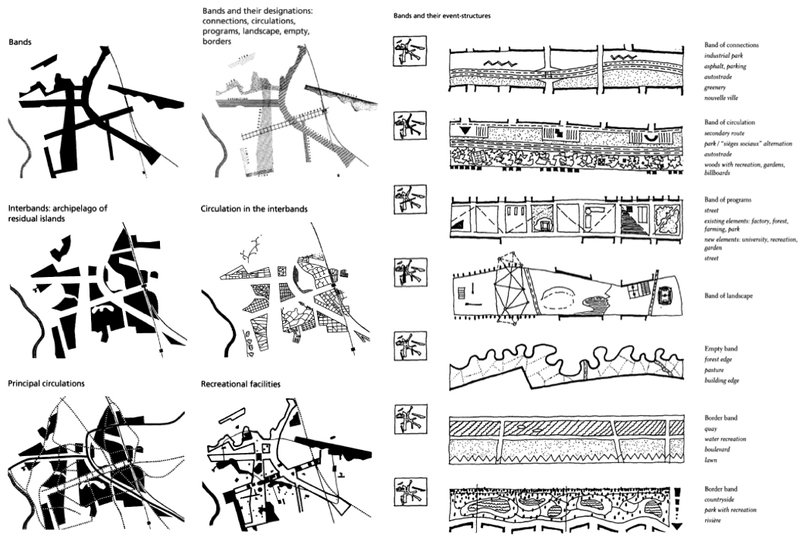 In the spirit of these challenges and our program’s subject matter, we’re kicking off a series of posts–each compiling a number of international projects that exemplify a specific genre of urban intervention–starting with this post on waterfront regeneration…please share, discuss and enjoy! In what was then a new peripheral city of Paris, a system of bands and interbands comprised of residential and public facilities were designed to guide and preserve open spaces and thus prevent excessive development. 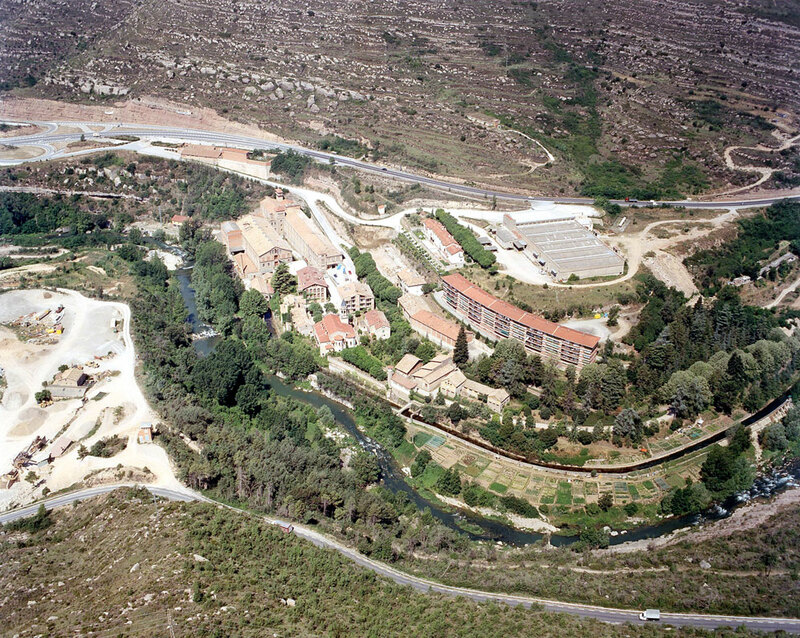 In order to create a sustainable framework for long-term transformation and development of this area, the project involved reorganizing the ground-figure of the landscape and infrastructure by exploiting existing topographical differences, projecting buildings as infill and integrating nature and the cultural history of the place. 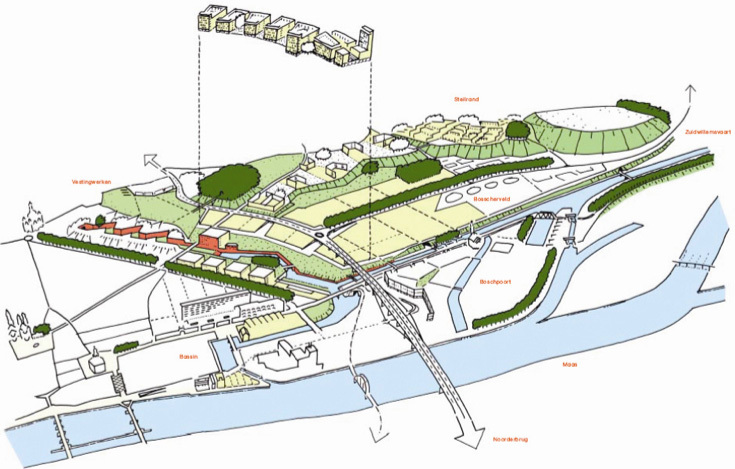 The aim of this project located in the floodplain of the Elbe River was to protect it from floods without overbearing the old quay walls and reconnect Hamburg to the river, achieved by raising the land beyond the quay walls and implementing public space typologies such as promenades, piers, boulevards, stairs and terraces of different scales that provide access to the river. 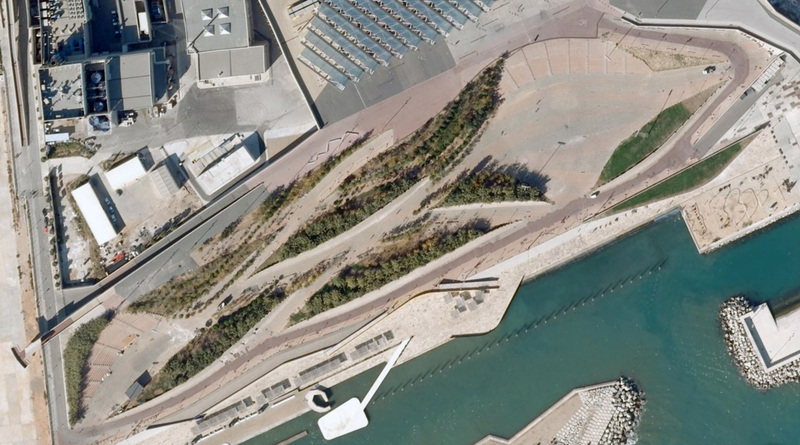 A sculpted landscape design creates an artificial seafront across 164,000 square feet, incorporating raised man-made dunes flanked by concrete and vegetation, and which provide bleachers for spectators sheltered from the wind. This public character of this park was revived with a series of public spaces assigned to different levels of the park, including newly terraced lawns, according to their specific purpose in order to protect them from flooding. 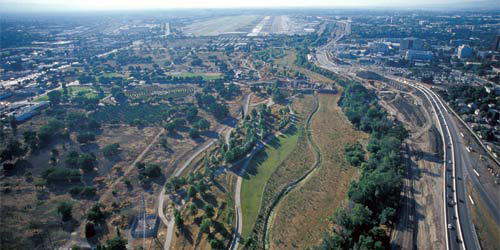 Designed as a flood control project doubling as a major recreation park and wildlife habitat, this project forgoes typical engineering measures in favor of integrating natural systems, allowing flood flows to produce landforms. The objectives of this inner-city wetland included improving the quality of urban storm water flowing into the Swan River, creating a protective habitat for animals, furnishing spaces for public use and flood control. Natural processes ensure water purification, elevated wooden boardwalks guide visitors through nature, and large swales divert water from the city while doubling as seating, playgrounds and a car park for visitors. emergeMUMBAI addresses flooding at a regional level, water management and public social spaces for housing redevelopment sites, and most importantly, it alleviates the insufficient water supply for the individual citizen. It combines urban rainwater harvesting techniques with successful Indian models for water consumption and development, and features a water filtration system that captures the monsoon rains, filters them vertically through the buildings and stores them at ground level. A project researched and proposed by the co-director of our masters program, the preservation of 15 small textile mill villages spread along the banks of a 20 km long stretch of the River Llobregat exemplifies how strongly committed it is with the care for local identity and environmental values, and proposes a civic network to ensure the development of vibrant neighborhoods connected through a river park. In another project led by our co-directors, this waterfront redevelopment of the River Rocha in Cochabamba aims to restore the ecological and social value of the river, and transform it into a positive urban space involved in the renewal of the nearby urban fabrics. Specific actions include designing a civic network made up of open public spaces, activities and elements of mobility by foot and bicycle essential to the new river corridor’s urban identity. note: This list does not intend to be a comprehensive or “top 10” collection of waterfront regeneration projects around the world, only a sample that can serve as a reference for research and most of all, as a starting point for discussion on urban design strategies in this field. Please share your thoughts or suggest other valuable projects in the comments section below! I think now, especially after these floods, Bangkok needs to begin considering something like this.